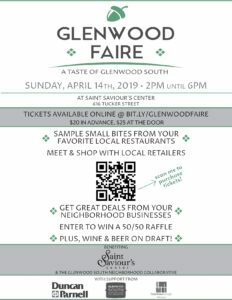 We are very excited to be participating in the Glenwood Faire: A Taste of Glenwood South on Sunday, April 14, 2019, from 2 until 6 p.m. at Saint Saviour’s Center (616 Tucker Street in Downtown Raleigh). The Glenwood Faire: A Taste of Glenwood South is an annual event that showcases restaurants, retail, and service providers based in the flourishing Glenwood South neighborhood of Downtown Raleigh. Not only will guests get to meet and sample from local businesses, but this charitable event will also raise funds to support the works of the Glenwood South community outreach organization of Saint Saviour’s Center. We hope you will come by and see us! Stop by our table to sample our delicious Italian cuisine and talk with our staff. Want a REAL taste of what Glenwood South has to offer? Make sure you purchase a Passport Ticket. They are $20 in advance and $25 at the door. Your tasting ticket allows you to sample from each participating restaurant as well as interact with all of the collaborating businesses. You will also have the opportunity to take advantage of limited-time specials from each of the businesses. In addition to food, wine and beer will be available for purchase and be sure to enter to win the 50/50 raffle! Want to come shop and socialize? Admission is free to fall. The tickets are for the tasting only. RSVP on Facebook and share the event with your friends! Check their website as it gets closer to the date for details on participating restaurants, businesses, and specials that will make The Glenwood Faire a downtown event you will not want to miss! We look forward to seeing you there. Saint Saviour’s Center is a community outreach organization that addresses unmet needs for low-income residents of Wake County. They serve families and retirees who have an income, yet struggle to make ends meet. Each year, the Center receives more than 17,000 visits from people seeking assistance.